Getting early access to a game used to be a pretty tall order. You might weasel your way into a limited beta, find a preview disk in a magazine, or poke around the shadier parts of the Internet. Today, it’s much easier: you can just buy your way in. Whether it’s through Steam or directly from the developer, increasing numbers of games are offering prospective players the chance to play the game before it’s official release. Of course this brings into the question the definition of release dates and what it even means to call a game “finished.” This week, we use Rowan Kaiser’s article on the topic to explore early access trend and what it means for customers, designers, and critics. Feel free to jump into the comments with your thoughts! Out of seemingly nowhere, a little unambitious game was included on both Scott and I's favorite games of 2013. 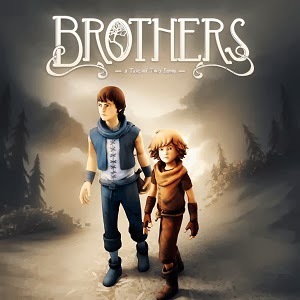 That game was Brothers: A Tale of Two Sons, a simple coming-of-age story that manages to achieve, seemingly with ease, what so many Triple-A games try to accomplish. This week on the EXP Podcast, Scott and I finally give the game the attention it deserves. Join us in the comments below! Much like the eponymous monsters for which it is named, The Walking Dead is back! This week, we have a thorough conversation on episode one of Telltale's second season of the Walking dead. For those of you who haven't played it, what are you waiting for? But seriously, you can listen to the first half of the show without fear of spoilers, as we use it as an opportunity to talk about adventure games, tweaks to the mechanics, and the state of the series in general. After that we jump right in with story details. We're looking forward to comparing notes with folks that made different decisions, so feel free to jump into the comments! The year has barely begun, but already the horizon is chock full of interesting titles, from competitive indie sword fights to face-crunching future-battles. This week on the EXP Podcast, Scott and I delve into our most anticipated games of 2014. There is a lot to be excited for if you are the optimistic type, so jump into the comments below and let us know what releases you eagerly await! Scott made Santa's shortlist this year and the jolly old man dropped off a beautiful Zelda-inspire WiiU on his doorstep. This week on the podcast, Scott and I explore some of the subtle and not-so-subtle elements of the WiiU interface. We also take our podcast ship on a tour through the "Miiverse" and try to understand the future of social platforms. Oh, and of course Mario makes an appearance. Have a comment to share on your WiiU experience? Leave us a note in the comments below or shoot us an email! We love hearing from all of you, so make a New Year's resolution to get in touch!